We suggest you how to buy your KOKESHI. Watch many KOKESHI and think "witch type do you like". "KOKESHI" is traditional doll at the Tohoku district in Japanese. This simple, beautiful doll that develops by the spa. How much person can draws KOKESHI without seeing. there are various names. "KIBOKO", "KOGESU", "KOGESUNBOGO", "OBOKO", etc. It was united by the alias of "KOKESHI" in recent years. The work of agriculture is a little in old times in winter in Tohoku. with a potter's wheel at this farmer's leisure season. It is people called "ROKURO-Shi" and "KIJI-Shi". In general, it is said that this is an origin of "Kokeshi doll". The record of the wife's selling the bowl etc. that the husband made to the guest who comes to the hot spring for curing the pain in the body and having walked remains at the farmer's leisure season. 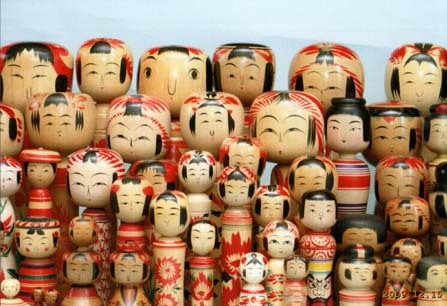 "Kokeshi doll" was souvenirs to children who had been doing the house sitting.
" Kokeshi doll" was children's important other party of play in the age when the toy was scarce.